Heirloom cherry tomatoes offer the same beautiful sweetness of heirloom beefsteak tomatoes in the same impressive color palette, but in a smaller package. Heirloom cherry tomatoes are ideal for serving in salads of all types and paired with our fresh hydroponic herbs. Our heirloom cherry tomatoes are available in colors to match our heirloom beefsteak tomatoes and arrive to your door perfectly ripened and waiting for you to take a bite. Baywater Farms heirloom cherry tomatoes are available in pints and 12 pint flats filled with sun-ripened, juicy sweetness. We grow our heirloom cherry tomatoes indeterminately so that they are available all season long. Baywater Farms heirloom cherry tomatoes work perfectly wherever you would use other varieties of small tomatoes, but they are delicious when quartered and tossed in salads. Roasting heirloom cherry tomatoes with a drizzle of olive oil and fresh-cracked pepper will give them a mellow flavor and transform them into a spread begging for a baguette. Heirloom cherry tomatoes can also be used to make fresh tomato sauce or soups. Heirloom cherry tomatoes are tiny gems of flavor that, when perfectly ripened, will put a huge smile on your face. 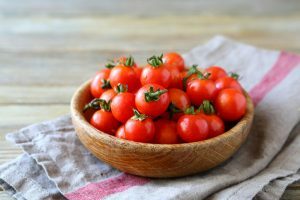 Ripe cherry tomatoes pull off the stem easily and have the same glossy sheen that ripe heirloom beefsteak tomatoes will get. Also like other types of tomatoes, heirloom cherry tomatoes are ripe when they are slightly firm when gently squeezed. Keep in mind that heirloom cherry tomatoes continue to ripen once they have been picked, so it is crucial to store them properly. Store your heirloom cherry tomatoes at room temperature inside of your home. Refrigerating your heirloom tomatoes will make flavor compounds break down and lead to a mushy, flavorless tomato. If you keep the stems and caps on your heirloom cherry tomatoes, they will last for a longer period of time. To get the most flavor and nutrition from your heirloom cherry tomatoes, eat them within a week (if you can last that long). Baywater Farms is passionate about cultivating non-GMO, heirloom cherry tomatoes with love and care in the same soil that our great-grandparents tilled. On our sixth-generation family farm, all of our non-GMO, heirloom, and sustainable produce is grown using high-quality seeds that yield gorgeous, colorful, and delicious results. We use ecologically-friendly farming methods and are dedicated to preserving the provenance of our seeds, re-introducing historical crops, and supplying everyone in the area with locally grown produce with a conscience. You can find our fresh heirloom cherry tomatoes in national grocery store chains, produce distribution companies, roadside farm stands, local farm-to-table restaurants, CSAs, and farmers’ markets. To learn more about ordering our fresh local produce, click here. Our top-notch sustainably grown, non-GMO produce speaks for itself, and we know your taste buds will love to listen!